This is the last documented use of seal A on a newly published Rakusan woodblock print. Rakusan did not include the Fan Series in his main sequence numbering. Therefore, the original number used for each of the 36 Series prints has been modified to identify the Fan Series members of its theme. The five different fan silhouette shapes have been here assigned arbitrary numbers 1 through 5. To indicate a fan design these shape designations are added to the 36 Series number separated by a hyphen. 110-3 is the Fan Series design with fan shape 3 in the 110 Persimmon theme. Like all other designs in this series, 110-3 was only produced in a single print run, and few copies are currently documented. The signature and seal markings and inconsistencies in style suggest that the 110 Persimmon designs were actually created over an extended period encompassing late 1933 into the middle of 1934. This theme is unusual in that it includes designs with four different seals which were produced in at least three distinct carving periods. The 110 Persimmon theme was evidently one of the original themes decided upon during the earliest planning stage for this series. Like the other seal A designs (as well as a few with other minor seals) 110-3 was carved within the last half of 1933. Except for 110-3 all of the other fan designs with seal A were incorporated into the first six themes (the first two installments). Then 110-3 (and probably also 110-1) were set aside to complete their quintet later on. At least some persimmon designs were adapted from sketches originally created in the late 1920s during the planning of design 19 of the earlier 100 Series (see below). 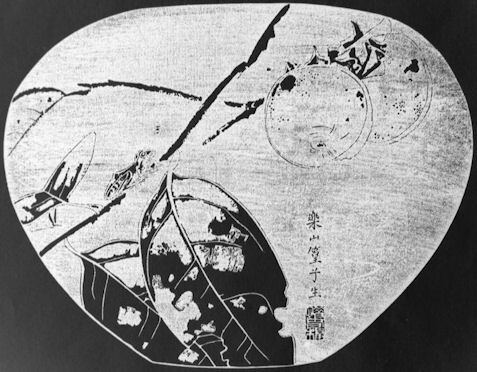 The composition of 110-3 includes two branches with leaves and two persimmon fruit. On the branch in the foreground sits a small tree-frog. Unusually, here and on a very few other early designs (including 110-1) Rakusan used an awkward double outline on many of the design elements. Here notice the double outline on the tree-frog, both fruit, and three of the four leaves which makes them almost seem out of focus. 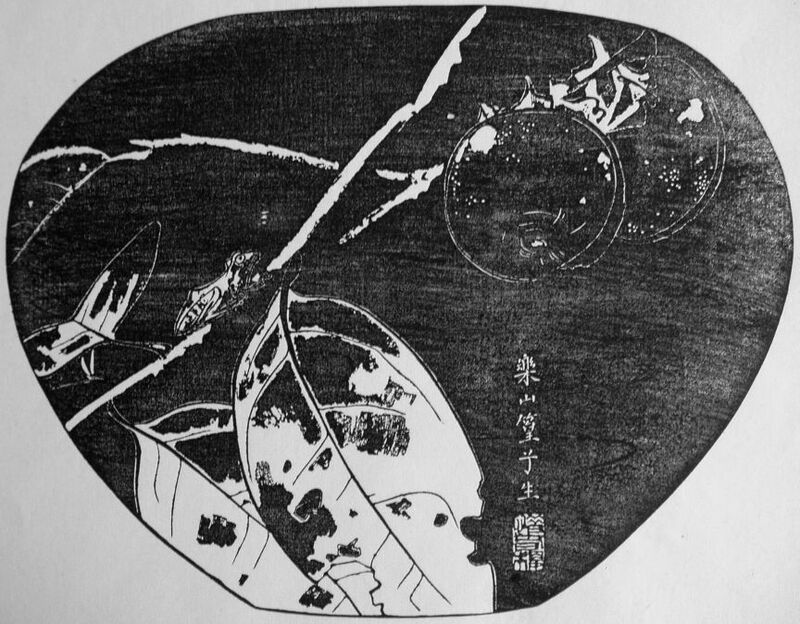 Rakusan recognized the shortcomings of this technique for ishizuri designs, and he soon abandoned it. Therefore its use is diagnostic of an early period carving date. Japanese Tree-frog, Hyla japonica, 日本雨蛙, にほんあまがえる, ニホンアマガエル, nihon ama-gaeru, lit. 'Japanese rain-frog', is a very small Japanese endemic species. From the tiny size alone, all of Rakusan's tree frogs are recognizable as this species, and the identification is confirmed by the skin markings as well.